The trucking industry is speeding toward disruption — the only question is what form inevitable change will take. Five key instigators: drones, self-driving trucks, Uber-ization, the Internet of Things and big data, will transform the industry, said Steve Sashihara, who leads information technology consulting firm Princeton Consultants, which has many transportation clients. 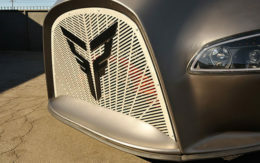 “Underneath this trendy labeling is a real, bona fide revolution in manufacturing and distribution, and hence, transportation,” Sashihara said as he outlined the results of a trucking industry executive poll last week during a teleconference hosted by Stifel Financial Corp.
Of all the technological changes on the horizon, the 149 trucking industry professionals answering the survey were most skeptical about drone delivery. Only 35 percent of participants expressed confidence that the technology would have a moderate or large impact on the industry within the next seven years. Sashihara, however, said that drone development activity is on an upswing. Drone companies are releasing new commercial models yearly, retailers such as 7-Eleven and Amazon are deploying the machines on test runs, and major vehicle manufacturers such as Mercedes-Benz are exploring drone integration. Still, drone operator liability issues remain unclear and freight companies are largely waiting for better iterations of the technology. For now, they use too much energy and are too expensive to make a good business case, Larkin said. Drone adoption will likely happen in three stages — for surveillance purposes, then for remote delivery to rural and hard-to-reach areas before eventually moving more mainstream, Sashihara said. Driverless trucks — once limited to the domain of billionaire businesses with extra play money — are experiencing an explosion of interest, Sashihara said. In October, Uber-owned Otto hauled a load of Budweiser beer through Colorado in a computer-controlled big rig. This month, suppliers showcased platooning technology and other driverless innovations at the Consumer Electronics Show in Las Vegas. And Scania and Toyota launched a truck platooning trial, which will eventually culminate in a manned truck leading a line of digitally-tethered driverless trucks on public roads between port terminals in Singapore. Platooning and driverless trucking can eventually halve industry costs, according to investment house Morgan Stanley, which declared 2017 “the year of the autonomous truck” in a Jan. 10 research note. “The road to a safe, productive, cost-efficient driverless trucking future will not be without its bumps, but the journey is well under way,” Morgan Stanley analysts wrote. Autonomous and self-driving trucks present “a very solid business case,” Sashihara said. Drivers account for about 33 percent of trucking operating costs, according to John Larkin, the Stifel analyst who organized the teleconference. 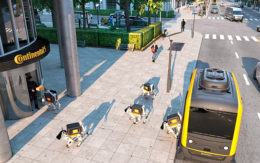 The vehicles help carriers avoid those labor costs while allowing the human operators to avoid fatigue-inducing long hauls and pursue a more sustainable lifestyle. Companies could gradually shift from trucks with expensive sleeper cabs to more efficient, lighter vehicles. Door-to-door autonomous delivery is still distant, Sashihara said. But support and oversight are growing, with a new Department of Transportation committee on automation — led by General Motors Chief Executive Mary Barra and Los Angeles Mayor Eric Garcetti — meeting for the first time earlier this month. Some innovations are already changing the freight transportation landscape. An Uber-ization effect is sweeping the industry, Sashihara said. Intermediaries are being stripped from the supply equation as start-ups such as DashHaul, Convoy, Cargomatic and Flexport help match spare capacity with volatile demand. This month, logistics technology company Loadsmart partnered with grocery chain Albertsons to provide instant pricing and booking for their spot business, identifying the most efficient carrier for a given load. Loadsmart also recently signed a contract with beverage giant Anheuser-Busch to provide the same “just-in-time” services. The trend is possible largely because of the Internet of Things and a preponderance of data, according to Sashihara. Real-time sensors on tractors, containers and even individual pallets or drivers funnel updated information to logistics nerve centers, allowing for incredibly precise tracking. Companies, already ramping up internal data collection, are also linking up with other businesses and governments to gather external data, Sashihara said. The effect on efficiency and innovation likely will be substantial. Sashihara urged freight executives to move quickly from gut-driven business decisions to strategy backed by data. Disruptive technologies will create shockwaves in many corners of the trucking industry — from workforce planning to pricing to inventory management, Sashihara said. Businesses could be better optimized. Paperwork could become obsolete and forecasting could become more accurate. A number of start-ups are jumping in. Shotput, which helps supply-chain companies track and organize operations, is pilot-testing robotic shipping containers that are prepacked at manufacturing centers with commonly ordered goods before being deployed to consumer markets. The containers are equipped with “smart” shelves that digitally record the type, amount and weight of inventory loaded in. The units can be tracked via GPS, monitored via apps and rerouted at any point. Delivery agents from UPS, FedEx and regional carriers can pick up items from the containers. Shotput, an Oakland, Calif., logistics company, is currently working with a major food and beverage company to try out the containers.